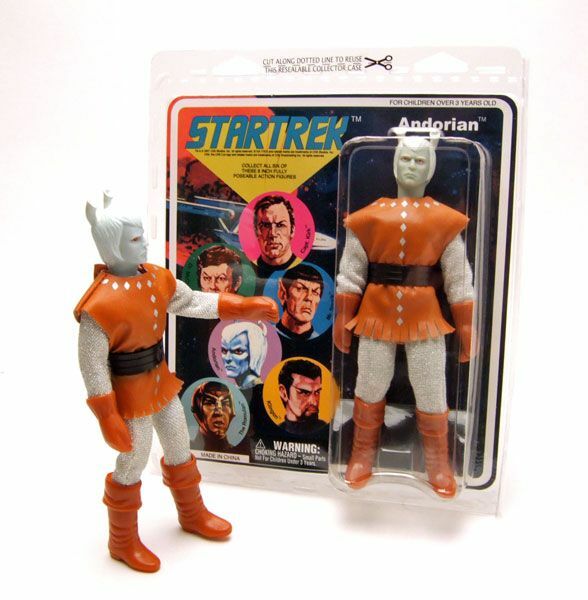 The Andorian was released carded as part of the third series of Mego 8" Star Trek figures (sorry, no carded pic on this one). 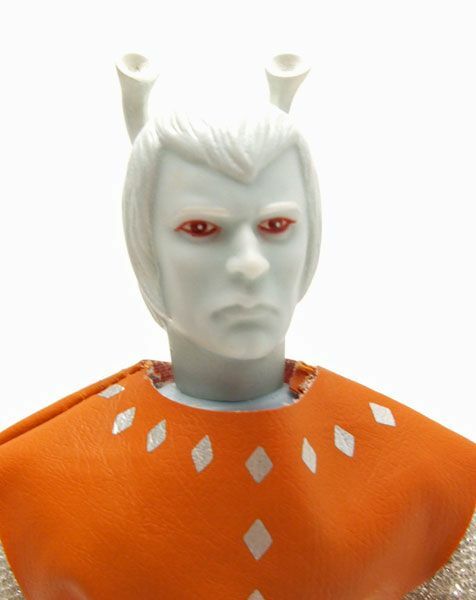 Though it's not based on a specific Andorian, the head (and cardback drawing) do bear a passing resemblance to Thelev from "Journey To Babel" (which if it was based on him would make this an Orion in disguise and not a true Andorian). 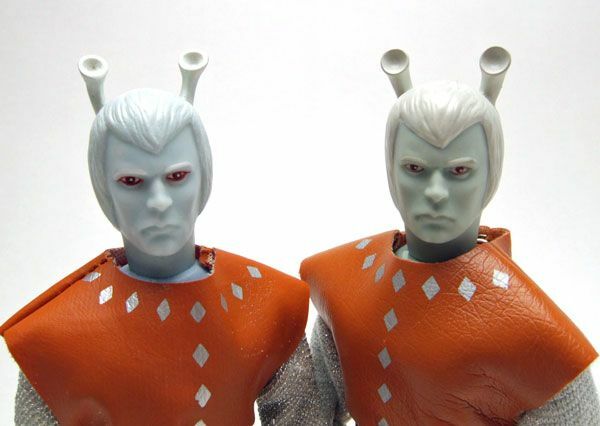 Either way, the head looks fantastic and perfectly captures the distrusting nature of the Andorian species. And you can't talk about the head without mentioning the antennae. 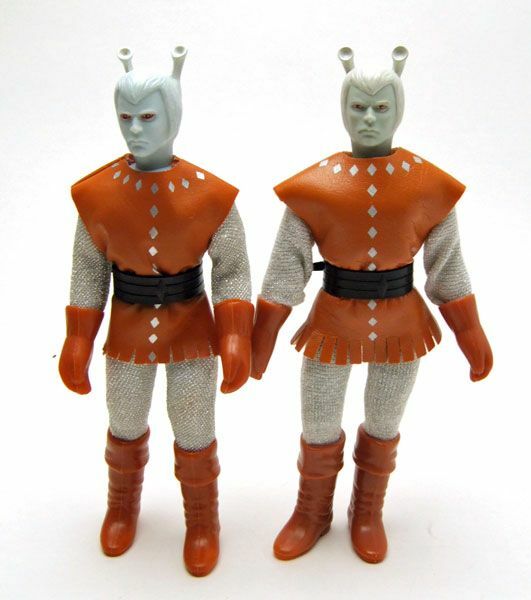 They are well sculpted, and look very much like their television counterpart. 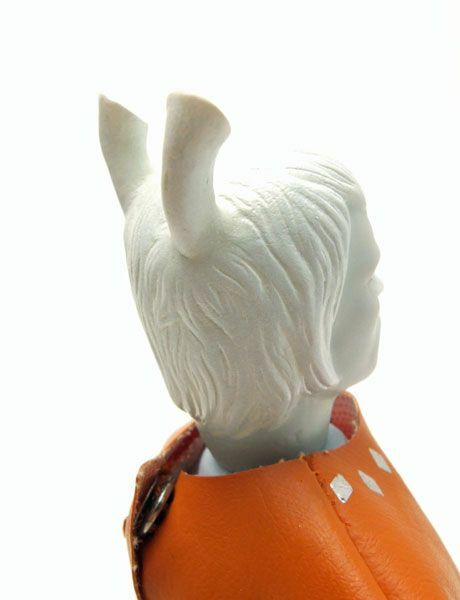 For a line that sometimes took great liberties with screen accuracy (I'm looking at you Gorn), the attention to detail on the Andorian's head is a very welcome surprise. The outift may not be entirely screen accurate, but the feel of the Andorian outfit is captured quite well. 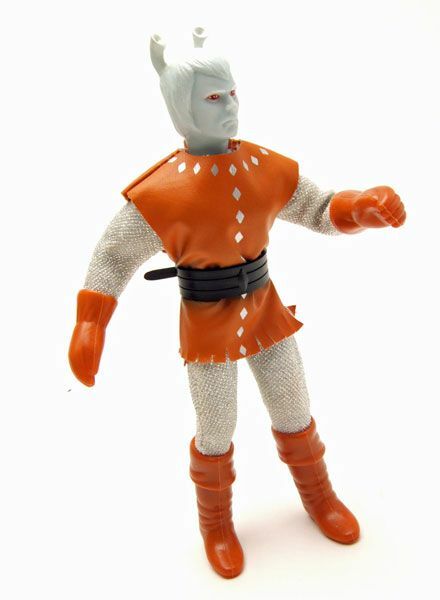 Mego thankfully went with the "Journey To Babel" look over the Andorian appearance from "Whom Gods Destroy", so no giant pink fuzzy sweater. Instead, we get an armor-over-chain-mail look that's done very well. 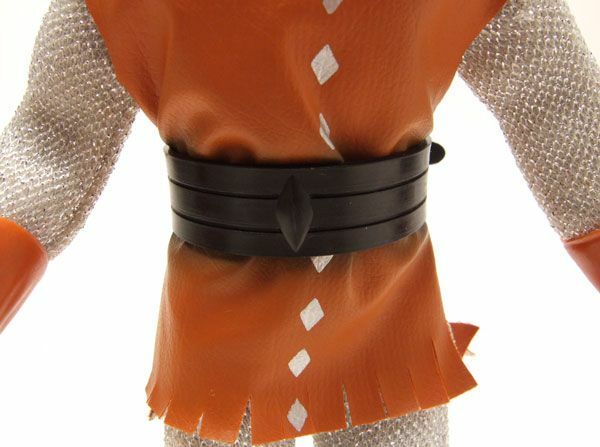 The black plastic reacts with the vinyl material, leaving a black stain all around the figures waist. 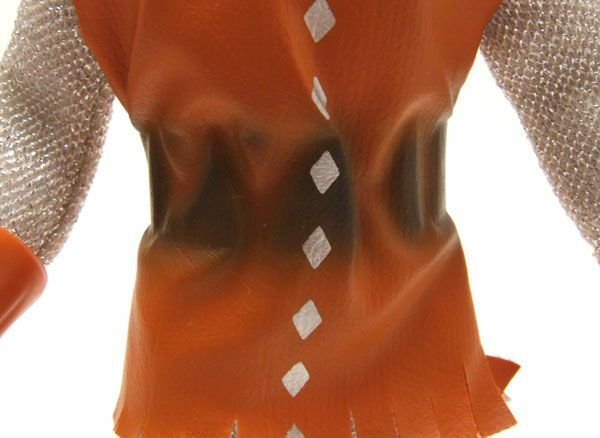 The staining can also seep through to the body suit underneath causing a brown stain ring around the mid section. There is a way of fixing this, but I myself haven't tried it. 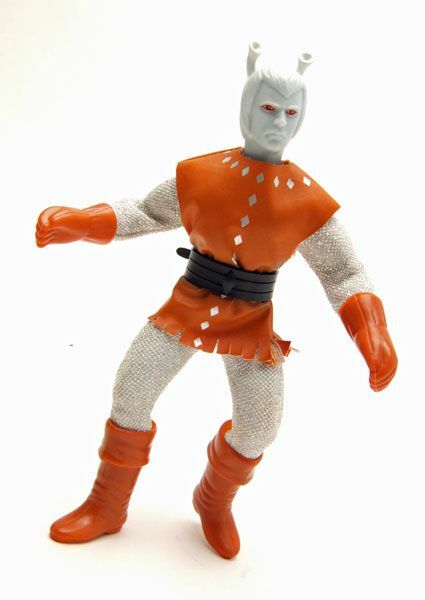 The details are over at Megomuseum.com- just click here. Oh wait...there is! 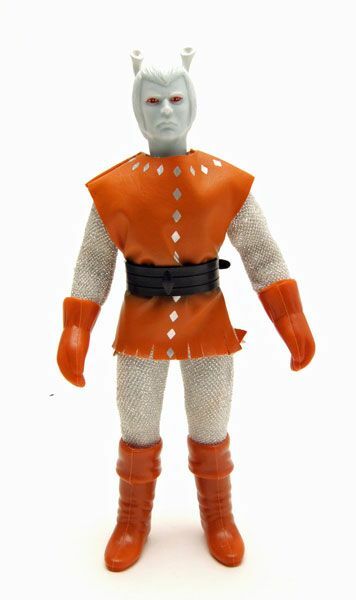 The Diamond Select Toys/ Emce Toys reissue version! The basic look of the figure is the same. There's very slight changes in the shades of color used, but overall they are very close in appearance. It's tough to tell them apart with just a quick glance. There is a pretty distinct difference in the bodysuit (at least on the examples I own). 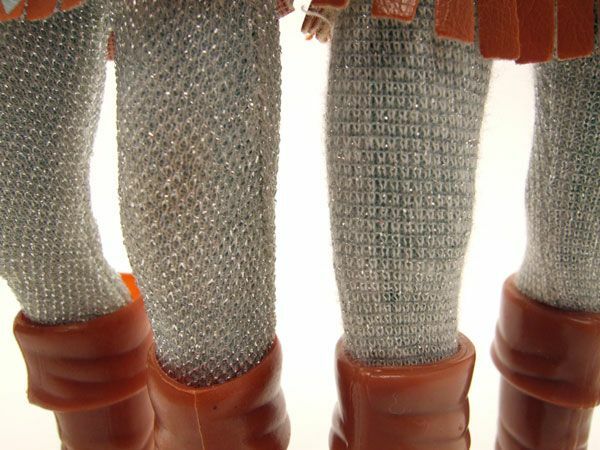 The original version feature a diamond-shaped pattern, while the reissue features a straight-line pattern. It's not a huge difference, but it does help distinguish the suits if you're searching for an original. Accessories: Neither the original nor the reissue version come with any accessories unless you count the outift, which I don't. 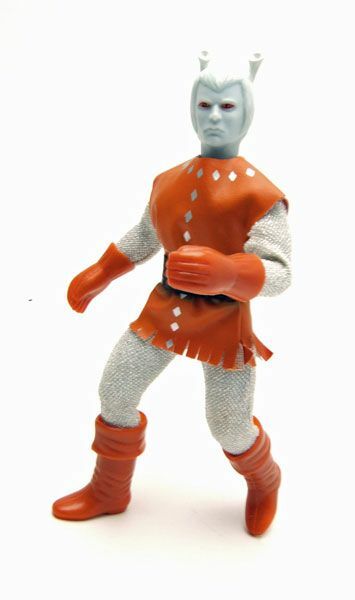 Due to the nature of the Andorian's gloves, holding a weapon isn't really possible, so I understand the omission. Oh! Don't forget you've got until 12:01 a.m on Monday Setember 28th to get your name in for a chance to win a DST Tapestry Picard! 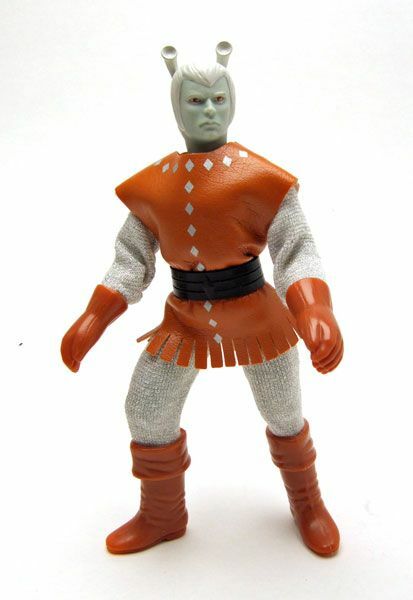 All the details are at the end of My Galoob Klaa spotlight from Friday. Good luck! 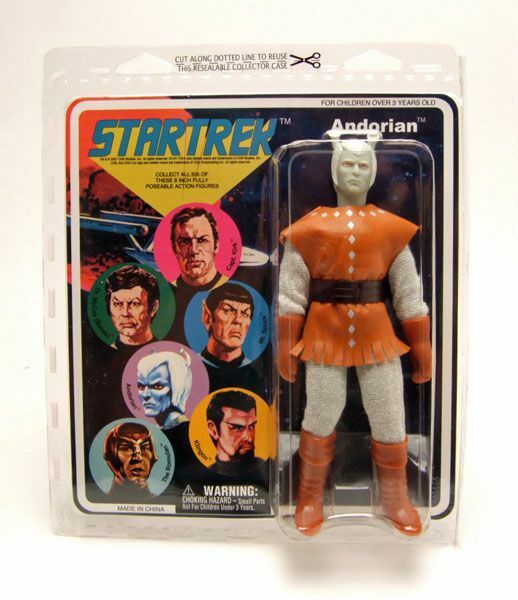 Labels: AA/ DST, Andorian, DST/ EMCE (Mego Style), Mego, Mego 8"